Q1 earnings reporting season kicks off this week. Analysts are expecting a 4.2% year-over-year decline in the aggregate earnings of S&P 500 companies (chart below). This will mark the first of such declines since Q2 2016. We believe that any earnings decline is something that should be taken seriously, particularly when it comes during a lengthy bull market. However, we also recognize that temporary slowdowns or declines in earnings are not uncommon and believe it is too early to assume that this earnings decline marks the end of the bull market. With earnings declining, much of the S&P 500’s advance in 2019 can be attributed to an expansion in the companies’ price/earnings multiples. That makes us slightly nervous since we believe that stock market gains solely driven by multiple expansion are more vulnerable to retracement. Therefore, companies need to deliver earnings that are in-line or above analyst estimates to keep investor enthusiasm (and P/E multiples) high, in our view. There are a few reasons we are hopeful that companies can live up to investor expectations. Past performance is no guarantee of future results. Estimates subject to change. 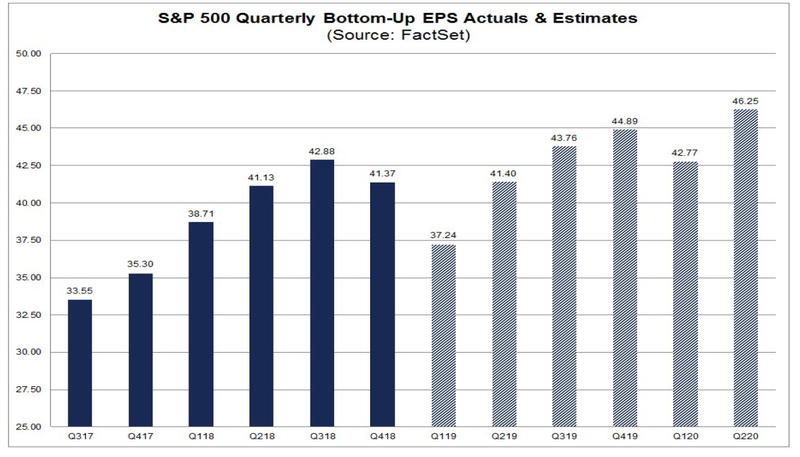 Revenues and Full-Year Still Positive: Despite a negative earnings outlook for Q1 revenues are still expected to grow by 4.7% in quarter and 2019 full year estimates also remain positive calling for 3.6% EPS growth and 4.9% revenue growth, as reported by FactSet. Environment Improving: Recently there have been some promising signs that the global slowdown, which also pressured corporate earnings during the quarter, may be coming to an end. Last week’s positive surprises in the global purchasing manager surveys (PMIs) and the US non-farm payroll report are two such examples. High-Bar, Now Lowered: The bar was ‘set high’ for the first quarter given that it is exactly 12-months after President Trump’s ‘Tax Cut and Jobs Act of 2017’ took effect. The ‘Act’ boosted earnings for S&P 500 companies by over 20% in 2018. Therefore, if there was ever a time for earnings to slow or decline it would likely follow just such an unusual period of growth. Given that S&P 500 earnings estimates declined by 7.3% (FactSet) since 12/31, companies and analysts have already been busy bringing down investor expectations. External Influence: Investors tend to forgive companies when their earnings are held back by an external event since they are often temporary and rarely can be predicted. According to a number of companies, headwinds in the quarter were caused by external events like new tariffs and trade restrictions that hurt exports and raised input costs; and the Federal government shutdown that slowed operations and impacted customer spending. Recognizing that global economies hit a ‘soft patch’ in late 2018 and early 2019, our portfolios are slightly overweight stocks, but maintain a more conservative posture than in years past. We are constructive on US equities but anticipate a period of single-digit annual returns, higher volatility, and slower earnings growth. We also continue to maintain a significant allocation to international stocks. Our international allocation favors Japan over Europe and maintains an overweight in Emerging Markets in our longer-horizon portfolios. From a fixed income perspective, we are slightly underweight bonds and prefer high quality investment grades over lower quality high-yield bonds and bank loans. The table below displays how our balanced portfolios have changed over the past 12 months to arrive at this more conservative positioning. High-yield securities (including junk bonds) are subject to greater risk of loss of principal and interest, including default risk, than higher-rated securities. Standard & Poor’s (S&P) 500 Index measures the performance of 500 large cap stocks, which together represent about 80% of the total US equities market. It is not possible to invest directly in an index. Earnings per share (EPS) is the portion of a company’s profit allocated to each share of common stock. Earnings per share serve as an indicator of a company’s profitability. The price/earnings ratio (often shortened to the P/E ratio) is the ratio of a company’s share (stock) price to the company’s earnings per share. The ratio is used for valuing companies and to find out whether they are overvalued or undervalued. RiverFront Investment Group, LLC, is an investment adviser registered with the Securities Exchange Commission under the Investment Advisers Act of 1940. Registration as an investment adviser does not imply any level of skill or training. 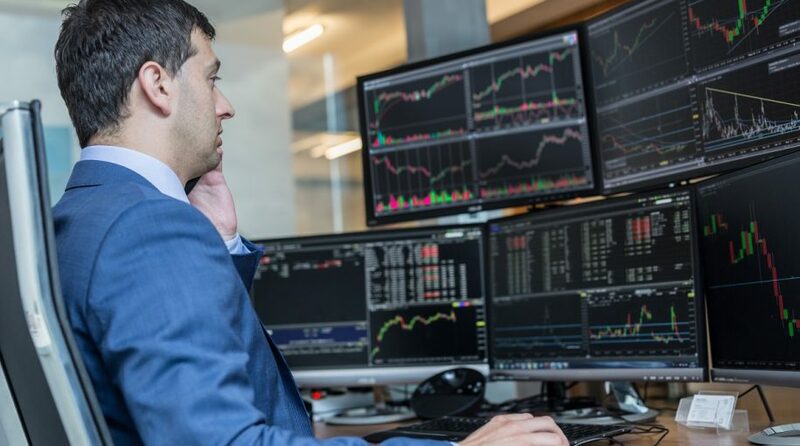 The company manages a variety of portfolios utilizing stocks, bonds, and exchange-traded funds (ETFs). RiverFront also serves as sub-advisor to a series of mutual funds and ETFs. Opinions expressed are current as of the date shown and are subject to change. They are not intended as investment recommendations.